This is the Phytobrick version of the promoter BBa_K2560131 (Promoter Dummy) and was build as a part of the Marburg Collection. Instructions of how to use the Marburg Collection are provided at the bottom of the page. Promoters are genetic modules were the RNA polymerase is recruited to start RNA transcription. They are divided in two groups: constitutive promoters which transcribe RNA permanently and inducible promoters which start the transcription as a response to a stimulus. Inducible promoters can be regulated by transcription activation or repression. To start the RNA transcription the RNA polymerase complex is not sufficient. Therefore sigma70 factors are required. The sigma70 factor binds to the Pribnow box – two motifs -10 and -35bp upstream the CDS – recruiting the RNA transcrition complex enabling the transcription (Huerta and Collado, 2003), ( Paget and Helmann, 2003). Based on this knowledge a collection of synthetic constitutive promoters have been developed by Chris Anderson and made available on the iGEM repository. We assembled 19 test plasmids with golden-gate-assembly and measured their expression strength, following our selfmade workflows. The results are shown in Figure 1. We observed an even distribution of the tested promoters throughout the dynamic range. The strongest promoter K2560007 (J23100) yielded 40 fold stronger signal than the promoter dummy and was used as a reference to calculate relative promoter strengths. The test constructs were built with dummy connectors which did not possess insulator elements. We assume that this resulted in additional expression caused by transcription throughout the rest of the plasmid, e.g. ori and antibiotic resistance. This is thought to add the same extent of signal to all measured promoters thus reducing the overall dynamic range. To further evaluate this assumption, we could repeat this experiment with one of our insulators instead of the dummy connector. 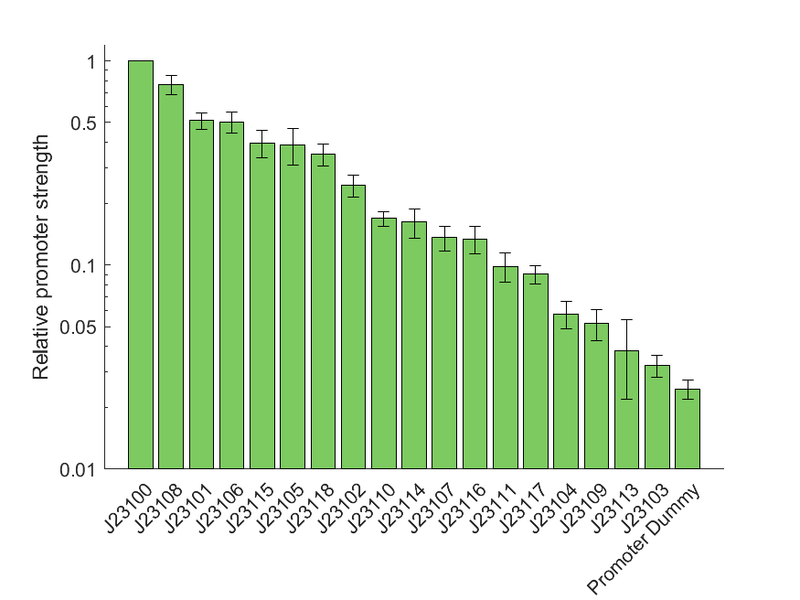 Figure 1: Relative promoter strenghts of promoters from the Anderson Collection in Vibrio natriegens. 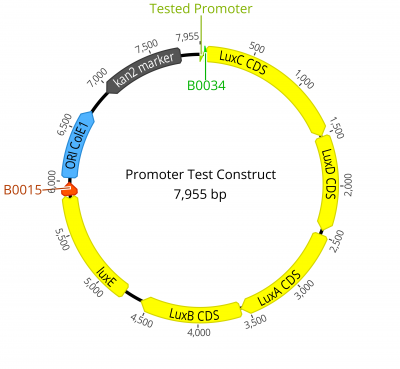 The promoter test construct is shown in Figure 2. Contruct were messured in quadruplicates and in three indipendent experiments. Figure 2: Contruct for messuring promoter strenghts. The label "Tested Promoters" is a place holder for the respective promoter. 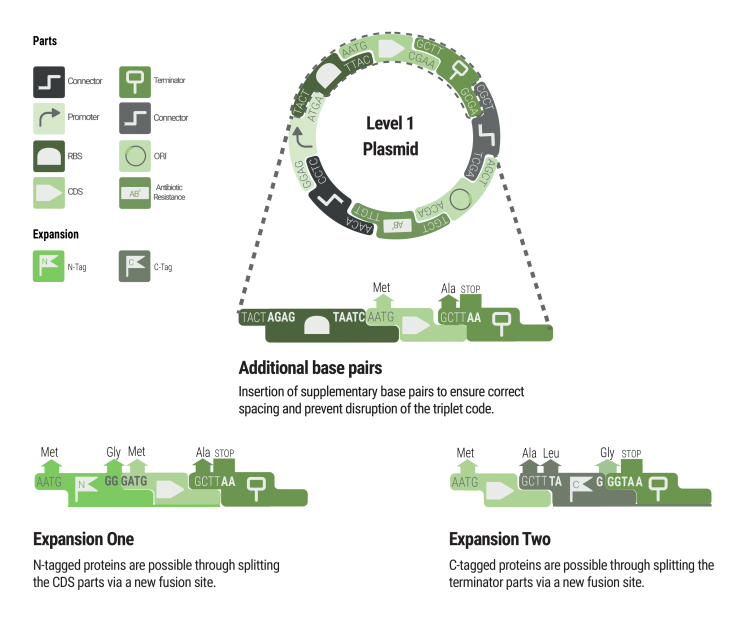 The plasmid was assembled from eight basic parts by Golden Gate Assembly. 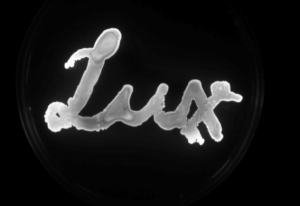 Marburg 2018 characterized this part in Vibrio natriegens using the lux operon of Photorhabdus luminescens (BBa_K2560051). 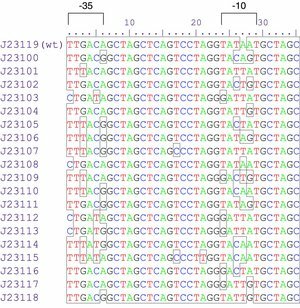 The parts sequence was verified by Sanger sequencing.